Are you worried about that persistent acne that has consistently interfered with your outgoing self? Well, you needn’t worry since you can easily eliminate it by getting rid of the bacteria that cause it. While this method requires you to be cautious, it yields the much-needed relief from the irritation, pain, and blemishes associated with the acne. You’ll need to go through the elaborate tips provided in this article to determine the best antibiotic formulation to cure the acne completely. You will also get safe advice on application methods and when to visit your dermatologist! 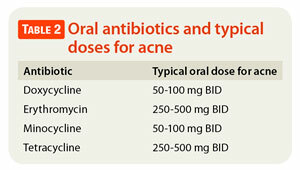 Is It Effective to Use Triple Antibiotic Ointment for Acne? Your skin is a highly sensitive organ and you should thus be careful with the topical applications that you apply. You can use this antibiotic in severe forms of acne. It works by inhibiting the growth of the bacteria that causes the pimples on your face. Well, the problem is sometimes associated with inflammation and you may be wondering just what to do to get rid of the inflamed lesions on your face, right? 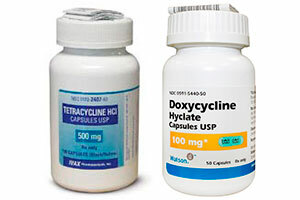 Tetracycline is the right product for you! It has some anti-inflammatory properties that ensure that you entirely regain the integrity of your skin in a few days. The antibiotic is primarily used orally where you’re required to swallow some pills several times in a day. If you’re not fond of swallowing medications, you shouldn’t worry since there are other numerous options for topical applications! Doxycycline. This is an oral product that is packaged either as a capsule or a tablet. The product targets the bacteria causing the acne and its working mechanism is similar to that of tetracycline. However, you should use this form of antibiotic when you are dealing with highly resistant acne that has persistently recurred. Avoid using the product for extended periods to avoid cases of resistance. Further details can be found here. You should administer this product orally by swallowing the recommended pills using lots of water. The product offers the best solution to acne and inflammation on your skin. When swallowing the pills, you should ensure that your stomach is unfilled to enhance its bioavailability. 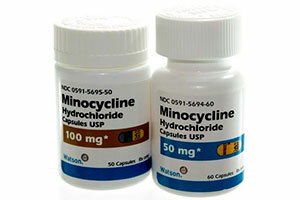 Visit minocycline for acne to read more about the product. This is primarily a prescription product that you should take following an advice from your dermatologist. The product is packaged as acne pills that you should swallow once daily with a glassful of water. You should never open the capsule before swallowing it! The product inhibits the growth of the bacteria causing the acne as well as prevent inflammation. Never give the product to pregnant women, breastfeeding mothers, and children under 12 years since it may have life-threatening side effects to them. 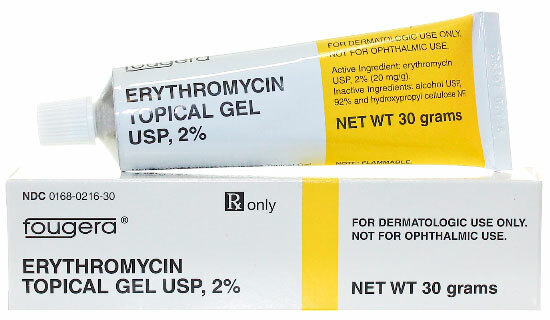 This antibiotic is prescribed to treat moderate to severe acne caused by bacterial infections. You should only take this product after a recommendation from a qualified doctor to avoid severe side effects. Always ensure that you complete the dosage prescribed by the dermatologist. When your acne is mild, you shouldn’t rush to use trimethoprim but rather apply topical benzoyl peroxide cream which is relatively safer for you. This product reduces inflamed acne and the ruddiness associated with persistent cystic acne. You’ll be required to swallow the pills as recommended by the doctor. To avoid nausea, you need to take the tablets when your stomach is full! 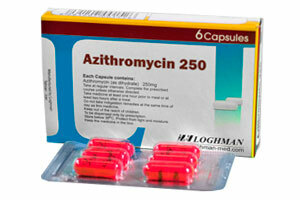 This antibiotic works by stopping the growth of bacteria that cause the multiplication of the acne on your face. They are primarily available as capsules, creams, and gels giving you a variety to choose from. When applying the product, ensure that strictly stick to the physician’s recommendations and use plenty of water. Cephalexin. While you may need to tell your doctor if pregnant, this product does not affect your unborn child. However, it passes through the breast milk and may harm the breastfeeding child. The product is primarily taken orally. You should ensure that you take the full dose to avoid cases of resistance. The product comes as tablets and have a high potential of eliminating the acne within 3 days. When using the product, your stomach should be full to increase bioavailability and quicken your relief. Ensure that you use a complete dose of the product without breaks to prevent bacterial resistance. This is the best treatment for you if you’re suffering from stubborn acne that will not just let you be! If you need to use the product, you should consult your dermatologist first for assessment. Use this product when all the other products have failed! The acne on your skin are caused by bacterial infections and using antibiotics may be the solution you’ve been looking for! The product inhibits the growth of Propionibacterium that causes the largest proportion of acne. Also, the antibiotics have an anti-inflammatory effect which significantly reduces the ugly bumps on your face. While bacteria cause the acne, they are not solely responsible for the condition. The natural sebum produced from your skin may accumulate resulting in blockage of hair follicles and consequently lead to acne. Some antibiotics reduce the production of sebum which in turn decreases the chances of clogged pores. As such, your skin remains healthy with no acne, blackheads, or whiteheads. Antibiotics come in different formulations to give you the convenience of choosing what suits you the best. You can opt to use the antibiotic tablets, capsules, creams, gels, or lotions without compromising their efficiency. 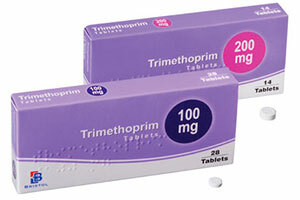 You should never apply tetracycline if you are a pregnant or a nursing mother! The drug can affect the growth and development of your baby’s bones and may lead to staining of your baby’s teeth. Your children should only use tetracycline after they get to 12 years to prevent discoloration of their teeth. Cystic acne are stubborn and difficult to treat due to their severity. They cause ugly bumps which are deep and filled with pus. Never prick cystic acne since it’ll lead to blemishes! 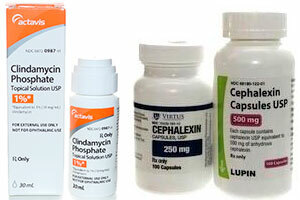 You should avoid self-medication in cases of cystic acne since they have the potential to destroy your skin. Always use natural means of treatment and only resort to medication when all your efforts have failed. Even then, you’ll need to consult your dermatologist before application of an antibiotic. You can choose to either use oral or topical antibiotics since they have similar results; they eliminate the inflammation and treat the acne without leaving behind spots. Depending on the severity of yourcystic acne, the dermatologist may apply a high dose of an antibiotic which is reduced as the pimples fade away. You may be required to take the antibiotics for a period between 2 and 4 weeks. The topical antibiotics may cause skin irritation which diminishes as you continue using the product as described in cystic acne treatment. 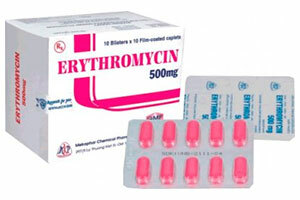 The most commonly used antibiotics are erythromycin, clindamycin, and tetracycline. However, any other antibiotic described in the first section of this article is effective and the product to use is determined by the evaluation of the dermatologist. While there are numerous oral antibiotics, not all of them are meant for acne treatment. There are a few products that yield the best results in treating hormonal and cystic acne. You can easily obtain some of the products including spironolactone for acne over the counter while others can only be applied after consulting your dermatologists. Ease of Use. You’ll just require swallowing the pills using a glass of water which takes significantly less time compared to the topical application. Reduced Irritations. Some topical creams irritate your skin especially if you’re suffering from cystic acne. The oral antibiotics save you from the discomfort while maintaining the efficiency. Highly Effective. The oral antibiotics eliminate the bacterial causing all skin infections. You can, therefore, be sure that the product will get rid of that stubborn acne! The product may have minimal side effects including nausea and dizziness. These effects can, however, be minimized by following the doctor’s instructions. In most cases, you should ensure that you take the medication when your stomach is full to reduce the severity of the side effects. Are you in desperate need of a quick relief from acne? Antibiotic topical creams are easy to apply especially when you’re not a fan of swallowing medicine orally. The products are easily applied to your face as well as all the other affected parts of your skin. When you’re suffering from cystic acne, the creams may cause irritation at first but the skin adapts to it over time. When buying the products over the counter, you should emphasize that the pharmacist gives you a cream of the antibiotic plus either benzoyl peroxide or topical retinoid to nourish your skin as you use the products. The ideal antibiotics for treating acne can be packaged into an ointment or a gel which is good for treating the acne while guaranteeing a skin free of scars. The ointments have a higher concentration of oil than the creams. This feature ensures that the product remains on the skin relatively longer which increases its efficiency. However, the doctor only recommends the use of these products if there is a need for the antibiotic to stay on the skin for prolonged periods. Otherwise, the doctor may simply let you use creams which are equally effective but are quickly absorbed and leave the skin fast. Almost all the antibiotics with cream formulation also have an ointment formulation. 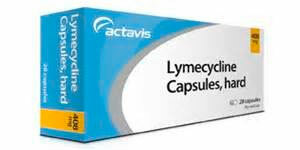 Some of the common products include clindamycin, erythromycin, and tetracycline. In some cases, the ointments may have mupirocin and other antifungal products for use depending on the need after doctor’s assessment. 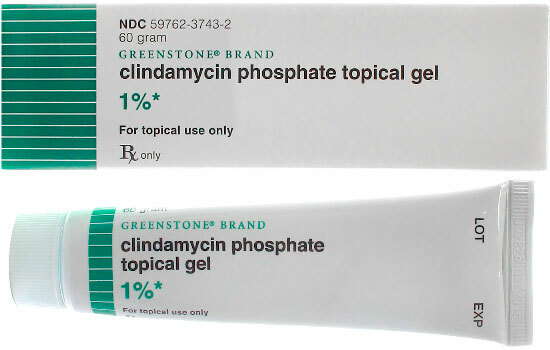 The ointments contain multiple antibiotics aimed at treating highly resistant forms of acne and skin infections. The products primarily contain neomycin, bacitracin, and Polymyxin B sulfate that create a synergy necessary for eliminating all bacteria causing the infection. The combination does not work against infections caused by other microorganisms including fungi. It is, however, critical to note that you should never misuse the products since it may lead to resistance in the future. As such, only use these products after a clinical evaluation to ascertain their necessity. While the product is highly effective, it is only necessary when the infection is caused by different types of bacteria that require different classes of antibiotics to treat effectively. It is applied topically two to three times every day for varying duration depending on the severity of the condition being treated. The best product to apply when treating acne on your skin depends on several factors including the severity, preference, and side effects of the specific products. 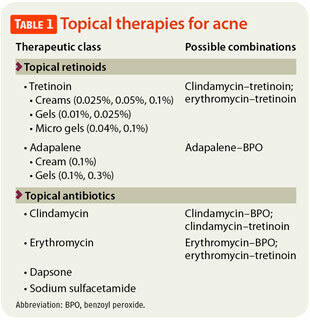 However, numerous reviews from different clients show a preference for topical antibiotics for acne treatment. These products are easy to apply since they do not require any technical experience. This is especially helpful to individuals who have difficulties swallowing pills and capsules which, in most cases, may lead to nausea and vomiting. Also, topical applications are used directly on the site of infection which ensures a quick onset of action for the products. The orally taken medicine may take longer to start acting on the bacteria since they require to undergo internal metabolism for systemic availability. The numerous metabolism processes increase the side effects of the products. As such, topically applied products have a narrower scope of adverse reactions which would otherwise cause discomfort to a majority of the people. Based on these factors, we can authoritatively recommend topical applications as the best remedy for acne. However, you should always stick to your doctor’s recommendations after evaluation. If a prescribed product is not working, reach out to the doctor to hear their expert opinions! Acne treatment can be cumbersome especially when you’re dealing with cystic acne. The condition has the potential to turn your life around for the worst! However, you shouldn’t allow the situation to take away your joy and self-esteem. If you’re suffering from the acne, you should peruse through the actions recommended by this article to resolve your problem. You can choose to buy the product of choice over the counter from the pharmacy of your choice. We, however, strongly recommend that you visit your dermatologist for expert advice before using any antibiotics for the treatment of your condition.